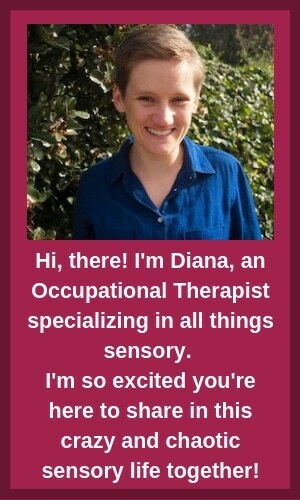 If you talk to any school occupational therapist, they’ll say they spend A LOT of time working on handwriting with their kids. Handwriting is a skill that takes a long time to master and this technology age isn’t making things any easier. Or, is it? 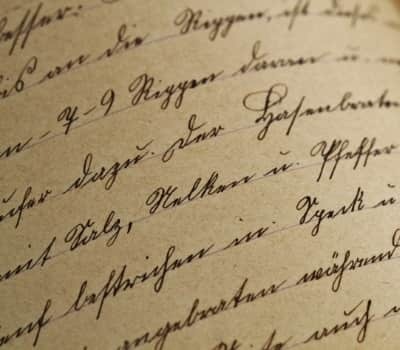 While kids may be typing away on keyboards more than they are putting pen to paper these days, using technology in the right way can actually help handwriting skills improve. 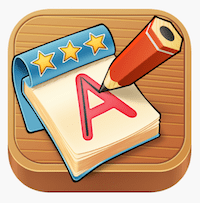 In this post, you’ll find my top handwriting app choices. These are not a replacement for paper and pen handwriting drills. Instead, these apps are here to enhance and support any of the handwriting practice you’re already doing with your child. Why do these apps often work? 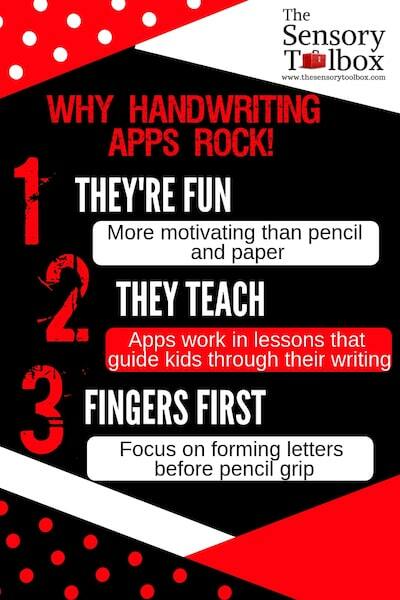 Handwriting apps are effective for some very key reasons. effective. Sure, any child can be forced to sit down with pen and paper to endless scrawl out the alphabet. But, how long can they do that without getting fidgety? How long can they do that before starting to despise sitting down to practice handwriting? A lot of the apps below are presented as games. This fun component is a big reason that kids stay motivated when practicing their handwriting. A piece of paper and a pen aren’t very exciting. No matter what, they just sit there. The great thing about technology is that it allows for a multi-dimensional, dynamic experience. While an app can’t take the place of your child’s teacher or occupational therapist, it can sure do a lot more than a plain old piece of paper and pencil. You’ll see that each of the apps below incorporate different types of techniques and methodologies. If you have any doubt as to which one is in alignment with what your child is already learning, ask your child’s teacher or occupational therapist. Sharing is caring! Click the Pinterest button in the corner of the photo! When we teach kids to write with a pencil and paper, we require them to learn two skills at once—holding a pencil and writing the letters. Holding a pencil correctly is a very challenging task by itself, so hard in fact that it can really discourage the child from writing. They may also be too young to properly hold a pencil and have a premature grip as a result. While a toddler can learn to draw letters with their fingers, they could be held back if they can’t hold a pencil. By using their fingers, they can get ahead on learning their letters before they’re ready for pencils. Holding a pencil is a skill that should be worked on separately from writing. 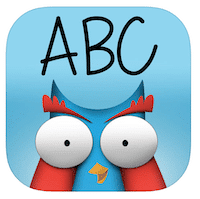 The phone and iPad apps below let kids use their fingers to draw words. 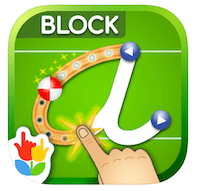 This lets kids get a really natural feel for the letters, using their best tools—their hands! This app is BEAUTIFUL! I just love all of the colors, illustrations, and designs. Aside from its beauty, iTrace is simple, easy to use, and effective. Understanding that kids need prizes and games to stay motivated, iTrace incorporates fun animations and iSpy games between their practices. When practicing individual letters, kids will use their fingers to draw each letter 3 times. During these 3 drawings, the app will help correct any mistakes, make demonstrations as needed, and reward the kid with a gold star when done. Something I love about this app is its customization and animation. Your child can write their name. Once they get it correct, their own picture will pop up with their newly written name tag. When practicing other words, a relevant scene will pop up. Once they write a word within the scene, an animation of the word will come to life. There’s a free and premium version of this app for $3.99. For less than $4, trying the premium version is definitely worth it. Letters have never been so fun as in the Letter School app. Your child can draw letters that look like candy canes, rail road tracks, spaceships, caterpillars, gardens, and so much more. The creativity behind this app is really fantastic. Letters have never been so fun as in the Letter School app. Your child can draw letters that look like candy canes, rail road tracks, spaceships, caterpillars, gardens, and so much more. The creativity behind this app is really fantastic. Every time your child gets your child gets a letter correct, their rewarded by special effects and a gold star. While Letter School is on the more expensive side of the bunch at $6.99, it can be a lifesaver for kids who really need visual stimulation to feel motivated. This app can be great for learners of any age, but I’d say that it skews younger towards the preschool age. 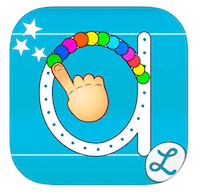 Similar to Letter School, Writing Wizard lets kids trace fun letters that reward them with special effects and stars when they’re done. As far as graphics are concerned, Letter School wins the prize. However, Writing Wizard has more capabilities when it comes to writing words and advancing to more advanced handwriting levels. Something I love about Writing Wizard is that it can work with a stylus. Once your child has progressed from using their fingers and is ready to work on their pencil grip, they can use Writing Wizard to seamlessly transition to a stylus. Ok, I have to admit that my favorite thing about this app is Ollie. Ollie the owl pops in on every screen with his big eyes and colorful feathers, just waiting to celebrate a handwriting win. Even though Ollie is my favorite, the graphics in this app overall are absolutely adorable. Talk about winning the cute app award! Ollie’s app not only works on handwriting, but phonics and spelling as well. Start with drawing each letter and work up to sounding out letters, sounding out words, and reading! Even though there’s a free version of this app, buy the premium version if you really want to experience Ollie’s app. With the free version, you can only practice letters a-m and 2 pre-set words. For only $2.99, you can get this app’s full capabilities, which is definitely worth that cheap price. So, what are you supposed to do if you’re working on your kid’s handwriting, but they need to be able to write RIGHT NOW to complete their school assignments? How can you give them the space they need to learn handwriting, while not falling behind in school? Ok, SnapType isn’t necessarily a handwriting app, but it can be a huge help while your child is using one of the other 4 apps listed above to improve their handwriting. SnapType lets kids take pictures of their assignments and worksheets. Once they’ve been captured in the app, kids can type or draw right on their worksheets or assignments to complete them. After they’ve finished, documents within SnapType can be sent directly to their teachers. They also can be stored on the iPad so that they won’t get lost! 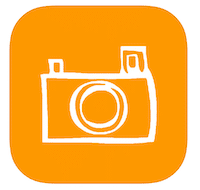 Of course, be sure to check with your child’s teacher before incorporating SnapType into your child’s routine. As you can see, technology can be crucial in helping kids learn an old-fashioned skill. Unlike the old days when we suffered through pages of practice drills, kids can become pro hand writers while also having fun. All of the apps above are similar in that they teach handwriting. Yet, they all do so in different ways. None of these apps will break the bank, so try some out and see which is most effective for your child. Are you looking for handwriting software that actually lets you print your own worksheets? 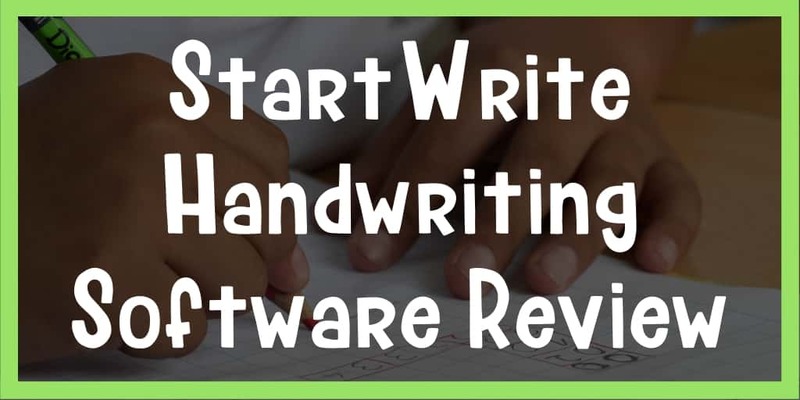 Check out my review for StartWrite Handwriting Software!